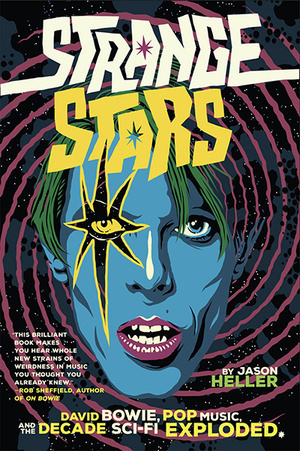 Jason Heller's Strange Stars, on David Bowie and sci-fi, is an exciting and loving look at a time when infinite wonder had a role in the pop music marketplace. Long before his untimely death in January 2016, David Bowie was arguably the most approachable and disturbing enigma in popular music. His career was not literally bookended by the Major Tom character from his 1969 breakthrough hit "Space Oddity", but it might as well have been. On his birthday, Bowie released Blackstar, his final album. The ten-minute video for the title song began on an unknown planet. Bowie, blindfolded, is singing as dancers shake. A female form with a tail approaches a reclining astronaut. Could this be Major Tom, still lost after all these years? She lifts the astronaut's helmet visor and we see "…a skull encrusted with jewels and gold filigree- the ornamented corpse of a space traveler left to spin through eternity." It's irrelevant whether or not this being is Major Tom, but the comparisons are undeniable. Author Jason Heller closes Strange Stars: David Bowie, Pop Music, and the Decade Sci-fi Exploded with this scene, the final gift Bowie was to give us in his lifetime, and those of us who followed the man through our lives can see the reasoning. The '70s were Bowie's to do with as he wished, and Heller nicely illustrates this by starting with the ethereal beauty and strange staying power of that original song and ending with the jarring strangeness of "Ashes to Ashes", the 1980 sequel. Science fiction would be of utmost importance for Bowie's music and image through at least 1975's Young Americans, when his appearance remained alien but the music turned soulful. George Clinton and Parliament Funkadelic (among many others) took the explicit science fiction mantle when Bowie strayed, but the movement elsewhere was not permanent. If Bowie was anything (and at times he was amazingly, seemingly everything) he seemed guided by the muses of Robert Heinlein's Stranger in a Strange Land, and (especially) Stanley Kubrick's 1968 cinematic adaptation of Arthur C. Clarke's 2001: A Space Odyssey. "I saw a tornado of catsuits, astronaut costumes, and gold lamé… I saw a songwriter who loved the wonder and fear and fun and transformation of science fiction… he compelled a decade's worth of fellow travelers to explore… with him." "[Jimi] Hendrix… devoured a 1957 novel… Night of Light… a mysterious radiation… causes reality to distort… the sunspots… are described as having a 'purplish haze.'" 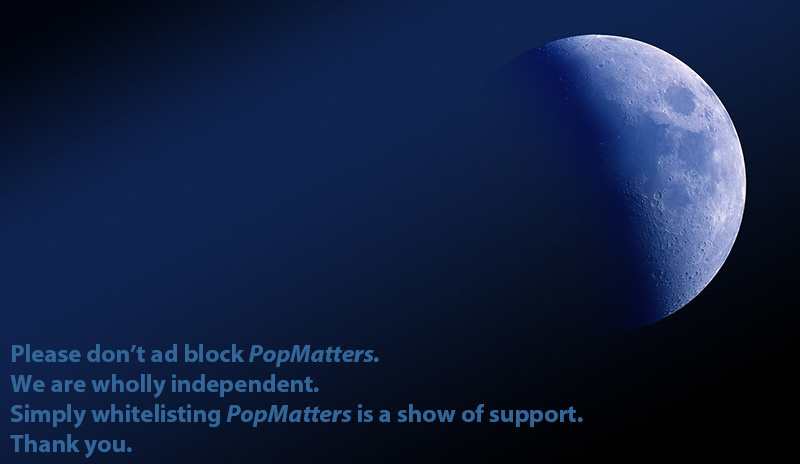 "The five minute jam-subsequently titled 'Moonhead,' …sounds like a ghost trapped in time… The fact that the live performance was intermittently overlaid with news announcers giving brief updates on the Apollo Astronaut's status only heightens the dreamlike feel." Certainly, a different narrative could be spun off exploring the sci-fi flirtations Pink Floyd had with Dark Side of the Moon and even The Wall, but it wasn't a major ingredient to their sound. Heller notes that the BBC improbably broadcast Bowie's "Space Oddity" during its Apollo 11 coverage, even though it ends with the lead character floating untethered through space. The story continues by noting that while Bowie was Number One at that time in England, the US was flirting with Zager and Evans' bombastic folk-rock hit "In The Year 2525". As the years progress (and all 12 Chapters of Strange Stars cover one year respectively) Heller brings in filmmakers George Lucas, Francis Ford Coppola, and Paul Kantner's Blows Against yhe Empire. There must have been something in that Northern California air, a residue of '60s activism, a creative end result of drug use that rolled through all these creative artists. "All this science/ I don't understand/ It's just my job five days a week." How would he survive in space if he had no understanding how to bring himself home? Why was he sent in the first place? "…Surrounded by bright light and the sensation of morphing into a form of energy…he left Earth and traveled to Saturn…aliens…advised him to drop out of college…Throughout the '50's and '60's [his albums]… tapped into combined sci-fi wonder and space-age hope with the rising tide of African American consciousness and civil rights." "His face was lavishly slathered with cosmetics. He wore a jumpsuit with a plunging neckline, revealing his delicate, bone-pale chest…"
The question wasn't so much who was Ziggy Stardust so much as what was Ziggy Stardust. The tern "Gender fluidity" was some 40 years down the road, and the idea here seemed to be more about performance and surprise. Bowie's sci-fi alter-ego Ziggy Stardust was born and released into the world in January 1972 only to have his final appearance in July 1973. This is followed by a chapter of the German group Kraftwerk, a narrative that seems appropriate yet out of place in this book. Strange Stars needs more Devo than Heller offers here, and less Kraftwerk. Save it for another book. Much better is the discussion of Robot moves/dances, like the Funky Robot and Michael Jackson's "Dancing Machine". By Chapter 7, "Your Memory Banks Have Forgotten this Funk: 1975", there's much more Heller could (and should) have offered about Clinton's metamorphosis from the doo wop of Parliament in the '50s to the funk of funkadelic. It's just too much to be contained as part of this narrative. Still, it works as a piece of the bigger picture. "Playfulness became a weapon of progress," Heller writes, and we learn that a reason the sci-fi theatrics of Parliament Funkadelic, Labelle, and Kiss might have seemed similar is because the three groups shared the same costume designer. We then get into the Canadian trio Rush, their 1976 album 2112, and its unfortunate (and mercifully brief) flirtation with Ayn Randian "libertarian science fiction". Heller justifiably gives the Langley School Project's 1976 heartbreakingly plaintive recordings of great sci-fi cover songs (including "Space Oddity" and Klaatu's "Calling Occupants") a section that could have warranted more attention. Why are these recordings still so haunting? (Fans of pure, primitive art will remember when this CD was released in 2001, before 9/11.) We trudge onward to get the rock band Boston and their claim to sci-fi (which didn't really go beyond the album cover), but the Langley School recordings linger and get the listener at a deeper level. This was sci-fi pop at its most natural, little kids digging into dark adult emotions and coming up with something rather sweet. "The most telling song was 'Space Junk.' It's about a torrential downpour of metal from artificial satellites…those chunks of debris could have been the spacecraft of Major Tom…"
There's a brief discussion of the classically bad Kiss Meets the Phantom of the Park TV movie, and the uninformed reader might be surprised to know that Jefferson Starship was the holographic band performing in the horrible CBS 1978 broadcast The Star Wars Holiday Special. Heller notes that Kiss frontman Gene Simmons and Van Halen singer David Lee Roth "…belonged to a certain school of sci-fi rock that… paid straightforward homage to the works of sci-fi they uncomplicatedly enjoyed." For those two, the risk of looking foolish was worth the price of expressing their joy of the form. Devo was something much darker. This seems to be the point of Strange Stars by the time we reach its end. Gary Numan and his hit "Cars" was as far away from warm and approachable as you could get. The machine was in full gear. Heller reflects on the 1979 version of "Space Oddity" as something even more strange than when it was first introduced ten years earlier: "The video ended with Bowie-as-Tom dangling lifelessly from a strange wall of seemingly alien design, attached by tubes…infusing him with life or draining it from him…"
Major Tom did return, in '80s "Ashes to Ashes" proving that not even David Bowie was immune to the lure of the sci-fi franchise. Though Strange Stars is filled to the brim with scores of recording artists who dabbled in sci-fi in what was for the most part nothing but a fervent passion and commitment, women are conspicuously absent. Debbie Harry of Blondie and their proto 1981 white rap "Rapture" was certainly an interesting take on sci-fi themes, but it seemed more of a flirtation. Kate Bush's 1980 song "Breathing" (and its video) was a more frightening look at an apocalyptic world where the environment was so devastated that life could only happen within a literal bubble. Minor quibbles aside, Strange Stars is a wonderfully excitable look at an era when everything seemed possible. The reader leaves this text gratified if only that Bowie lived to see (and apparently appreciate) Canadian astronaut Chris Hadfield's singing and playing his own version of "Space Oddity" while on the International Space Station in May 2013. Major Tom might have been a "junkie/Strung out in Heaven's high/hitting an all-time low" in 1980's "Ashes to Ashes", but Hadfield made it soar in a place where it's probably always going to be bouncing back and forth across the eternal infinite evening sky.